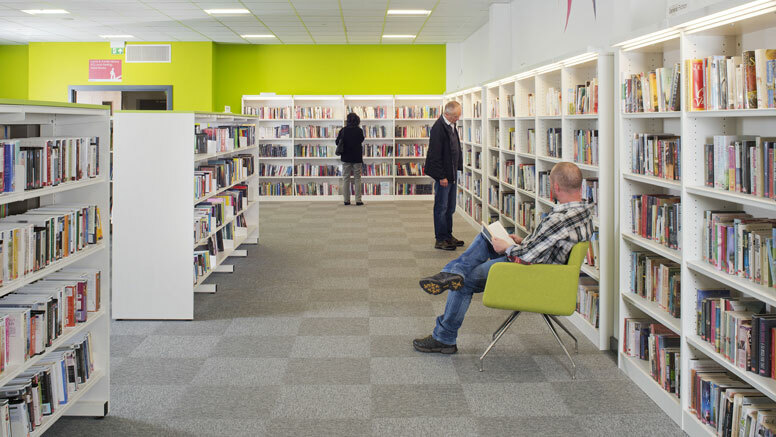 Demco Interiors partnered with Kier Construction through the initial consultation period and then as design and FF&E consultants for the library, adult and children’s services areas and council offices (including meeting rooms and a kitchen). We carried out an audit of the old library and then planned the new space to fit in all the existing stock. The existing steel shelving was upcycled and wrapped in vibrant white, with end panels to look light and fresh. New shelving with built in lighting becomes an avenue of popular fiction, ending in an eye-popping lime green wall. We created the children’s library with standard children’s library furniture and shelving to make it fun and spacious. Upstairs local history, reference and IT spaces are bright and welcoming with a much talked about local history graphic featured on the mobile shelving stack. The designs for Children’s and Adult Services were based around coloured themed rooms and we carefully selected furnishings that were of contract quality but still homely and comfortable. Council offices are functional with a mix of fixed workstations and individual tables for hot desking. A shout of colour is added with lime green and raspberry red desk mounted screens. A well equipped small kitchen is a coffee break away from heads down working and is furnished with black and orange tables and chairs. Staff and visitors are delighted with this new Centre which benefits from so many facilities being in one place.